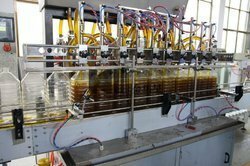 We are offering our clients a wide range of automatic filling machines, toner filling machines, capsule filling machines, automatic rinsing machines, liquid filling machines, auger filling machines, capsule filling machines, paste filling machines, packaging machines etc. Our range is renowned for varied features such as High efficiency, light weight, easy handling and corrosion resistance. Ever since our inception, we have laid immense emphasis on quality parameters of our range of machines so as to avoid discrepancies at clients end and attain complete satisfaction. The collective expertise of our experienced professionals has enabled us to manufacture a range at oar in quality standards. Our specialization also lies in rendering special purpose machinery along with full liquid, powder filling lines on turnkey basis. Our range is exported to diverse countries such as African countries, Nigeria, Senegal, Ireland, Middle East and South Korea.